Tree-ring patterns provide data about past climates. Trees contain some of nature's most accurate evidence of the past. Their growth layers, appearing as rings in the cross section of the tree trunk, record evidence of floods, droughts, insect attacks, lightning strikes, and even earthquakes that occured during over the lifespan of the tree. Subtle changes in the thickness of the rings over time indicate changes in length of, or water availability during, the growing season. Each year, a tree adds to its girth, the new growth being called a tree ring. Tree growth depends upon local environmental conditions. In some areas the limiting factor for growth is water availability, in other areas (espoecially at high latitudes) it is the length of the growing season. In areas where water is limited and the amount of water varies from year to year, scientists can use tree-ring patterns to reconstruct regional patterns of drought. In areas where the length of the growing season is the limiting factor, the thickness of tree rings can indicate when growing seasons were longer (during warmer times) and when growing seasons were shorter (cooler times). The study of the growthe of tree rings is known as dendrochronology. The study of the relationship between climate and tree growth in an effort to reconstruct past climates is known as dendroclimatology. At locations where tree growth is limited by water availability, trees will produce wider rings during wet and cool years, than during hot and dry years and the rings are wider. Drought or a severe winter can cause narrower rings too. If the rings are a consistent width throughout the tree, the climate was the same year after year. By counting the rings of a tree, we can pretty accurately determine the age and health of the tree and the growing season of each year. Modern dendrochronologists seldom cut down a tree to analyze its rings. Instead, core samples are extracted using a borer that's screwed into the tree and pulled out, bringing with it a straw-size sample of wood about 4 millimeters in diameter. The hole in the tree is then sealed to prevent disease. Computer analysis and other methods have allowed scientists to better understand certain large-scale climatic changes that have occurred in past centuries. These methods also make highly localized analyses possible. For example, archaeologists use tree rings to date timber from log cabins and Native American pueblos by matching the rings from the cut timbers of homes to rings in very old trees nearby. Matching these patterns can show the year a tree was cut, thus revealing the age of a dwelling. Tree ring data is only collected outside of the tropics. Trees in temperate latitudes have annual spurts of growth in the summer and periods of dormancy in the winter, which creates the distinctive pattern of light and dark bands. Tropical trees grow year-round, and thus do not have the alternating dark and light band pattern that allows us to read tree ring records. 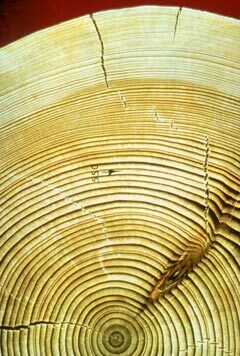 Tree ring records can be combined to create climate records that span a timeframe longer than the life of a single tree. For example, the data from a living, 200-year old tree could be combined with a data from wood from a tree that was felled 150 years ago (after living a couple of centuries) to produce a composite dataset spanning several hundred years. Trees, alive or dead, are not the only source of wood used to construct such extended records. Beams from old buildings or ruins, samples from wooden frames of old paintings, and slivers from violins have all been used to add wood samples from trees long dead to climate chronologies. In some cases, tree rings enshrined in petrified wood even give us some insights into climate conditions in truly ancient times. The oldest trees on Earth, the bristlecone pines of western North America, can live for more than 4,000 years. Dead bristlecone trunks, often well-preserved in the dry terrain upon which bristlecones grow, can be as much as 9,000 years old. The proxy climate record preserved by tree ring data spans a period of about 9,000 years. The resolution of tree ring data is one year. Tree ring records are amongst the highest resolution proxy climate data types, but they also have one of the shortest time spans over which they apply as compared to other proxies. This map shows sites from which tree ring samples have been gathered. Tree ring samples are collected in temperate zones where the trees have annual growth patterns that produce rings. Credit: National Oceanic and Atmospheric Administration Paleoclimatology Program/Department of Commerce. Here are some additional resources that you might find interesting (not required).